Is it just me, or does there seem to be a black face on the cover of almost every Fall Fashion issue this year? It is only the sixth day of August, and already, I’ve counted eight—no, nine—major fashion magazine covers featuring black talent, including Vogue, British Vogue, W, British and Canadian Elle, Harper’s Bazaar and Glamour. 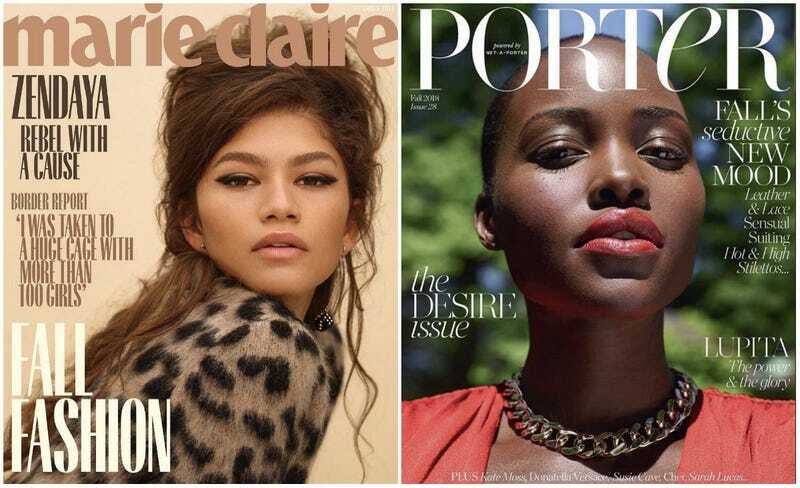 And while we were still collectively swooning over the reveal of Beyoncé’s history-making covers on Monday, another double fantasy came true as Zendaya and Lupita Nyong’o were revealed as the covers of Marie Claire and Porter magazine, respectively. While some of these moments have been history- and career-making; others have simply been refreshing. After all, watching many of our faves emerge as the faces of Fall 2018, an unfamiliar feeling has taken hold; something strangely like ... parity? And to what do we owe this tremendous pleasure? The Fenty Effect? The Wakanda Effect? The Beychella Effect? The “I’m Rooting for Everybody Black” Effect? All of the above? Or, perhaps it’s the 2017 Nielsen series on #BlackGirlMagic that turned the rest of the world on to what we’ve been knowing: That our love and loyalty are strong when and where we feel represented? But it’s only a myth if we actually buy issues—and if we know nothing else about our place in America, it’s that our collective buying power is skrong. I can write articles all day long here at The Root, but the only clear way for us to effectively express that we like what we’re seeing this season and want it to continue is to say it with our wallets. Personally, I’ve been buying every black cover of a magazine I’ve seen since I too was told we weren’t marketable—because I’m defiant like that. We’ve already proven that we can break box office records, sway television ratings, and make one of the world’s biggest music festivals become the biggest concert event of the year, simply on the strength of its first woman of color headliner. So, what else do we have to prove? That we don’t just inspire fashion and beauty trends—and our increased visibility isn’t a trend, either. We are inspirational. We, too, are fashion. We are beautiful.